What an amazing inaugural season for the FLL jr! To help celebrate and show off all the amazing work by our Youngest Engineers, their creations and their Teams, Chelsea Robotics Partnered with the Chelsea Public Library to host the first FLL JR. End of Season Expo. The turn out was tremendous and much fun was had by all. At the event Chelsea Robotic Boosters presented a plaque to celebrate our special partnership with the Chelsea Public Library for their integral help at launching our inaugural season. We look forward to working with the Library again next fall. Please stop by the library to see a small sampling of our Teams creationa on display in main entrance way of the library. Special thanks go out to the FLL Teams, The Cakenstiens and the FTC Beach Middle School Teams, Crash, Gremlins and Glitch for showing off their robots to our youngest Engineers. 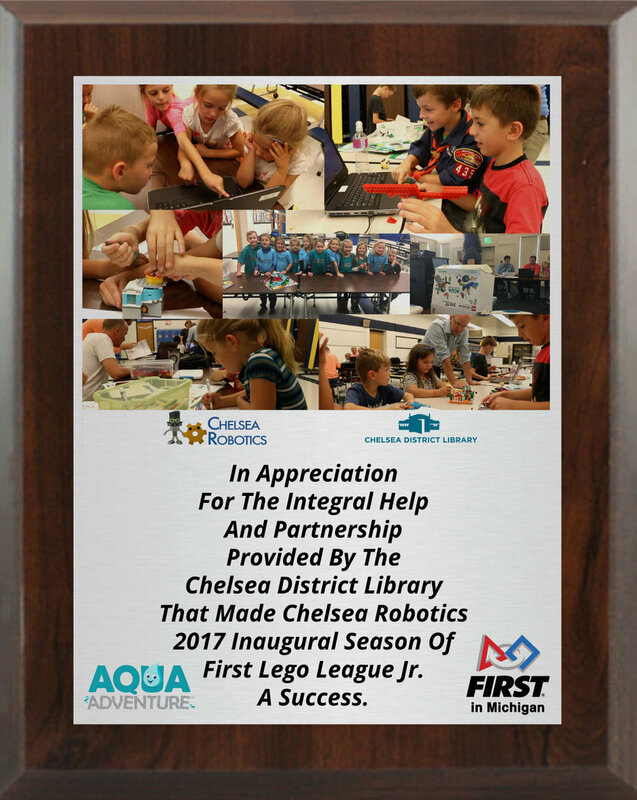 FLL Jr and Chelsea Robotics graciously thanks the Chelsea District Library for Making our 2017 season a success. We fielded 9 FLL Teams: Swamp Dragons, Water Otters, Mega Legos, Team Wave, River Dogs, Chelsea Flames, Snowballs, Lego Builders and the Water Team. 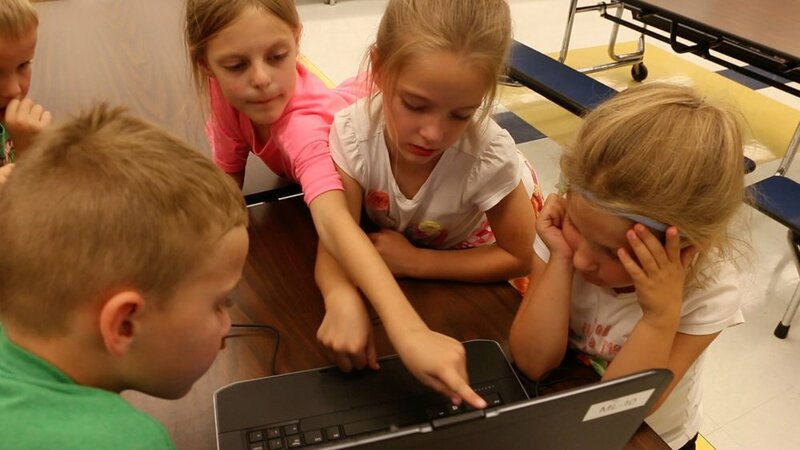 We rostered 53 students between grades first through third at North Creak Elementary. 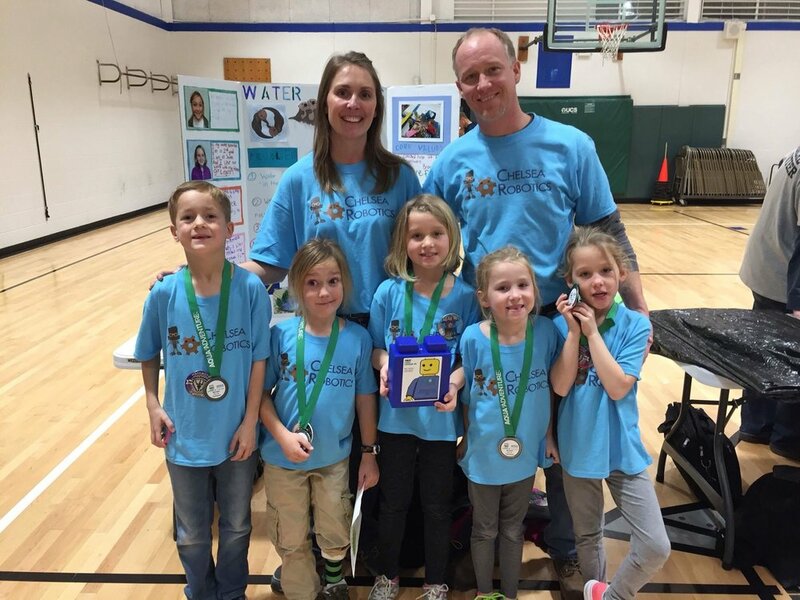 One in seven North Creak Students participated in FLL Jr Lego Robotics! Attended FLL Jr. Expos throughout south east Michigan. Made significant gains toward gender parity for our Young Engineers in FLL Jr. with a 40%/60% spit between girls and boys. Thank you Chelsea District Library for making this year possible. We look forward to many more. Registrations are now open for families looking to enroll their child in FLL Jr. (First Lego League Junior).